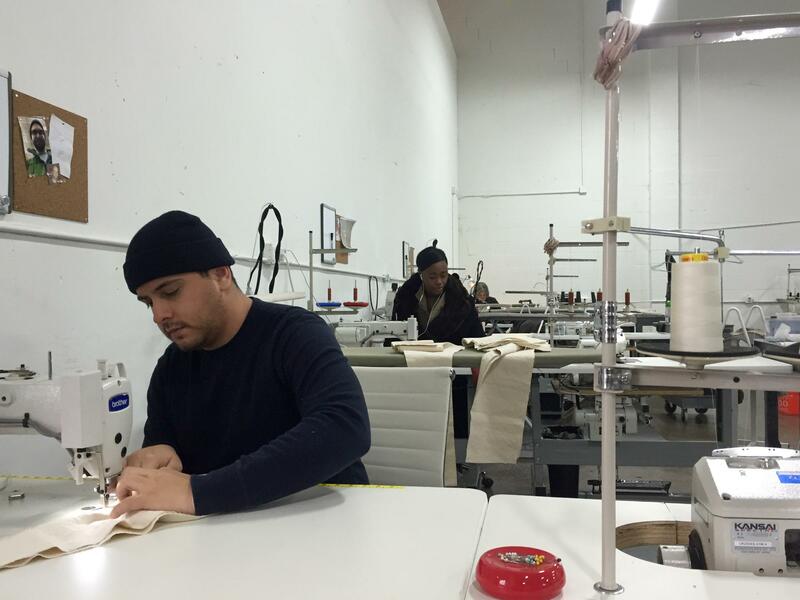 Alfie Rivera, head of production at Elizabeth Suzann, is one of 14 employees at the growing Nashville fashion company. An oversized warehouse in South Nashville is where Elizabeth Suzann clothing is born: boxy tees, long loose dresses and slouchy silk pants. The color scheme is dependably neutral. "We use blacks, grays, oatmeals, creams, and then we use very simple silhouettes. We don't use a lot of zippers, any metal, no beading," says founder and designer Elizabeth Pape. She's wearing a slouchy taupe turtleneck as she gives me a tour of the warehouse. Her style has clearly found a market: Last year, Elizabeth Suzann brought in $1 million in sales, and it's on track to triple that revenue this year. Not bad, considering Pape started the label in her spare bedroom three years ago. Last year was also when Elizabeth Suzann started getting high-profile national press — in the New York Times' style magazine. And Pape's new wedding line, featuring simple white dresses (and a jumpsuit) that are machine-washable, is making the rounds on fashion blogs. When a Nashville designer gets national fame, the city's burgeoning fashion industry gets a boost, too. But the positive attention also poses a challenge: How can the industry keep pace so that its biggest brands don't outgrow Nashville? Compared to the meccas of New York and Los Angeles, Nashville hasn't historically been known for its fashion beyond cowboy boots and hats. "There's nothing wrong with cowboy boots and hats, but Nashville style is so much more than that," says Van Tucker, CEO of the Nashville Fashion Alliance. "When you have a brand like Elizabeth Suzann that breaks out on the national stage, it causes people's mindset to shift a little." Elizabeth Suzann only sells online or directly out of its warehouse, bypassing part of the typical clothing distribution chain. She points also to designer Amanda Valentine, who competed on Project Runway a few years ago, and the custom denim company Imogene & Willie, which was featured on CNN and Esquire.com. But the Nashville fashion industry is still small, and it's missing key parts of the supply chain. For example, Pape says Elizabeth Suzann has had a hard time finding skilled workers. "What we've done is just do all of our training ourselves," she says. 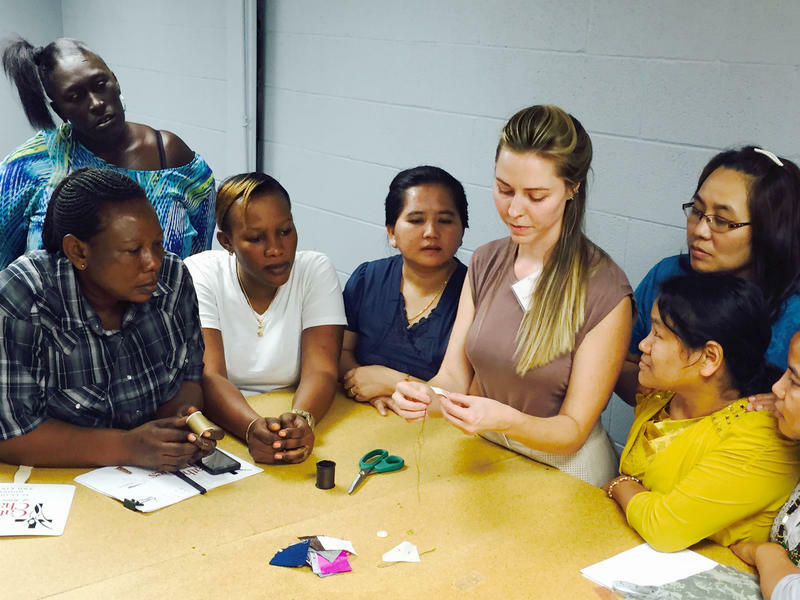 "We hire people who know how to sew and then we train them to do industrial-type sewing. There is not a big pool of people who are knowledgeable and ready to do this job with all the skills that they need." Pape says that hasn't been prohibitive yet for Elizabeth Suzann — the company has been growing steadily and now has 14 employees. But if a company gets really big, and the industry here can't sustain it, there is a risk it might leave, says Tucker. "People have to run and grow a business, and if they can't do that here, we can't ask them to stay here and sacrifice their business," she says. "I hope we don't lose brands, but I certainly don't fault them if they feel like they have to be somewhere else." 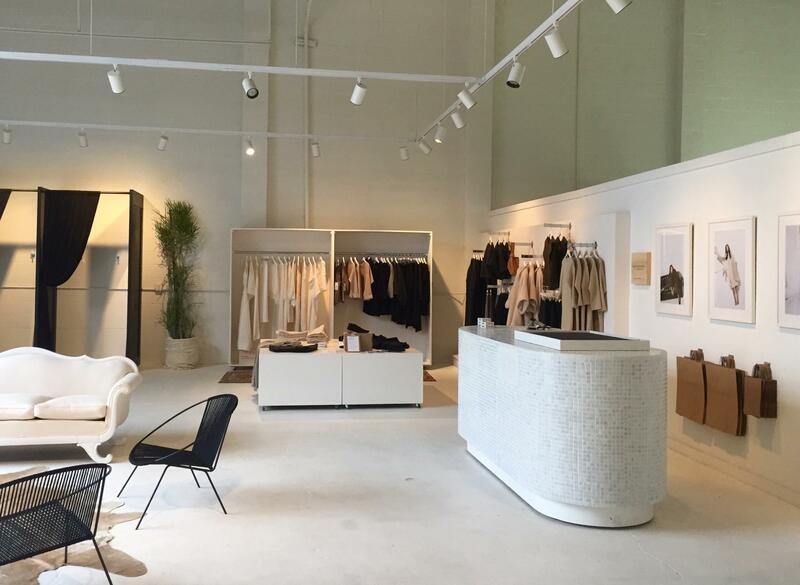 Elizabeth Pape works inside the label's 10,000 square-foot warehouse in South Nashville. The fashion industry in Nashville has been pondering this challenge for a while. A much-cited Nashville Scene article in 2013, by Abby White, pointed out other challenges a growing fashion company might face here: The industry lacks the high-stakes competition that could force a designer to improve; a company might have difficulty getting the attention of wholesale buyers. "Developing and sustaining talented designers will take more than boot camps and favorable press mentions," White wrote. "It will require rethinking the way we view creative industries that don't revolve around music, health care or technology." In the three years since that article was published, the fashion industry has been making strides to grow its ecosystem. That's one of the main goals of the Nashville Fashion Alliance, which started in early 2015 (and credits the Nashville Scene article as inspiration). The organization is working with Catholic Charities of Tennessee on a sewing academy to train more workers for manufacturing jobs. It also just finished its first six-week accelerator program, designed to foster and develop business plans for fashion companies. And there is a benefit to being outside of the fashion meccas, says Pape. "Being outside of the fray is helpful," she says. "I think it helps me to not feel overwhelmed and intimidated and just part of this big machine. It is nice to feel a little bit separate and a little bit independent." People often ask her if she wants to move Elizabeth Suzann to New York or Los Angeles, she says. Her response? No. In Nashville, she's doing just fine. The newly formed Nashville Fashion Alliance cut the ribbon today on a new training program, meant to rebuild the number of skilled garment workers. But the classes have a double purpose: They’re operated by Catholic Charities and intended to help immigrants and refugees find work. Ten students at a time will take the three-week course, tucked into the back corner of a warehouse on the East Bank of the Cumberland River. The first group mostly consists of women who’ve come to the U.S. from Africa and Asia. Most aren’t yet comfortable speaking English.